The School of Health Professions moved into its new space in August, bringing the Physical Therapy, Occupational Therapy and Speech-Language Pathology programs into one building on the Long (Main) Campus. The move was at least four years in the planning stages, said Dean David Shelledy, Ph.D., RRT, FAARC, FASAHP, Dean of the School of Health Professions. Each program had the opportunity to design teaching labs and facilities to best fit the needs of their profession, he said. Feedback has been favorable. “The most common comment is, ‘We love it,’” he said. Before the move, the OT and PT faculty and students had to take a shuttle from the Greehey Campus for events. The School’s deans’ and administrators’ offices will move to the new location in November. The much larger facilities occupy 46,114 square feet on the ground level of the Dental Building and offer space for students to engage in various teaching lab activities. The audio-visual electronics capabilities are vastly improved, Shelledy said. The new space has yet to be named. 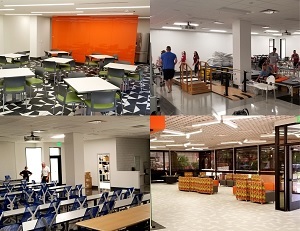 In addition to dedicated research space, expanded faculty office space, a student lounge and study areas, the facilities also include two large flex labs to accommodate students from any program on a scheduled basis. Later this fall, the space soon will house seven anatomage tables. The only department not on the Long Campus is Emergency Health Sciences, which has certain space requirements for its programs, Shelledy noted.